Bust front measurement: 56cm on the client and 49cm on the pattern. I divide it in half because there are two side seams. Now it's obvious that I need to shift the side seam 3.5cm outwards at this level. Under-bust front measurement: 47cm on the client and 40cm on the pattern. I got the same value for the bust line and the under-bust line. It is then logical to assume that the entire side seam of the dress should be shifted 3.5cm outwards. I fill in the entire column with that value. I will most likely need to apply some changes when I start calculating the back, which is why I referred to it as “pre-calculations” at the start. The second thing you need to pay attention to is the clip measurements. - Towards the armscye: 13cm on the client and 12cm on the pattern. I need to add another centimeter. - Towards the corner: 12cm on the client and 12.5cm on the pattern. I won't account for this small difference for now. I write a zero in the table. I will decide on the best way to shape the corner of the corset when I start drawing the neckline. I need to make the clip towards the neckline 3cm longer. Actually, the neckline on the pattern goes below the bust line. I don't think it's a good idea to make such a low neckline on a dress for a middle-aged woman. It is better to stop above the bust line. Side length: my client’s measurement is 18cm and it is 19.5cm on the pattern. I need to adjust it down by 1.5cm. 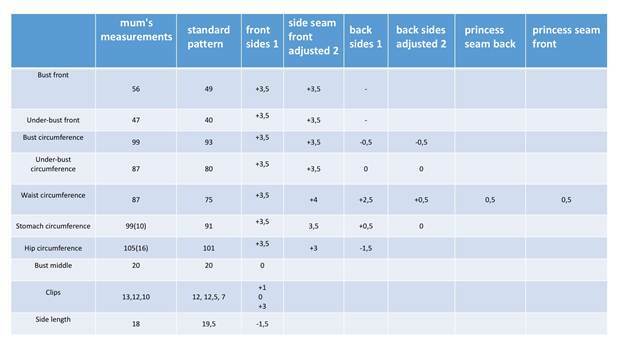 The fourth column will contain the final values for adjusting the side seam. I leave it empty for now. Let’s move to the back of the dress. 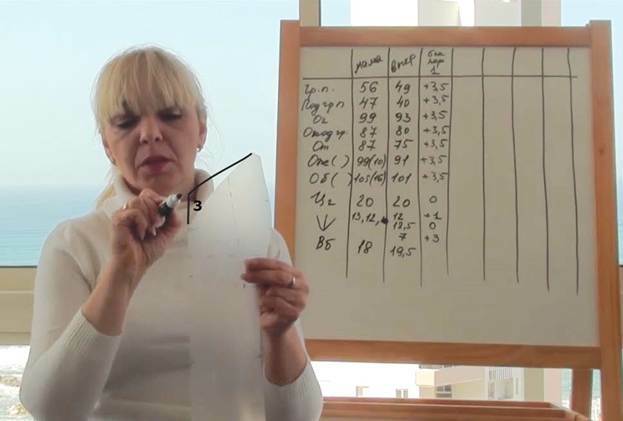 First I will pre-calculate the configuration of the side seam and write the values under “Back Sides 1” (column 5). Let us start calculating. You will see what happens after I take into account all measurements and values from the table. Bust circumference: 99cm on the client and 93cm on the pattern. I have, however, already added 3.5cm from each side of the pattern, which makes a total of 7cm. I divide it in half. I need to adjust the back down by 0.5cm from each side at the level of the bust line. I write -0.5cm in the table. Under-bust circumference: 87cm on the client and 80cm on the pattern. It means there are no alterations along the under-bust line at the back. I write a zero in the table. 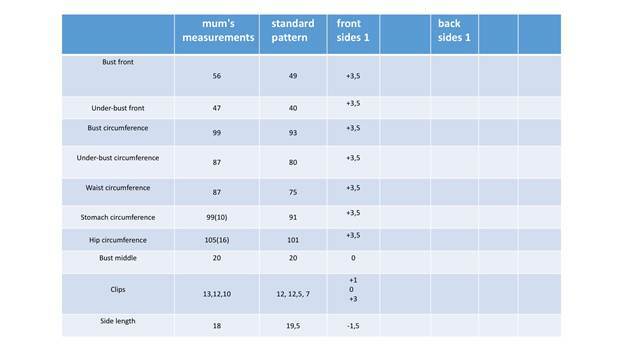 Waist circumference: 87cm on the client and 75cm on the pattern. But I have already added 3.5cm from each side of the pattern, which makes a total of 7cm. I divide it in half. I need to make the back 2.5cm wider from each side at the waistline level. I write 2.5cm in the table. Stomach circumference: 99cm on the client and 91cm on the pattern. I have already added 3.5cm from each side of the pattern, which makes a total of 7cm. 99cm – 98cm = 1cm. I divide it in half. I need to expand the back by 0.5cm from each side at the level of the stomach. I write 0.5cm in the table. Hip circumference: 105cm on the client and 101cm on the pattern. 105cm – 108cm = -3cm. I divide it in half. I need to adjust the back down by 1.5cm from each side at the level of the hip line. I write -1.5cm in the table. You must have already noticed that, judging by the adjustment values in the table, the side-seam side of the back is going to look very wavy. Let us work with the values from this column. 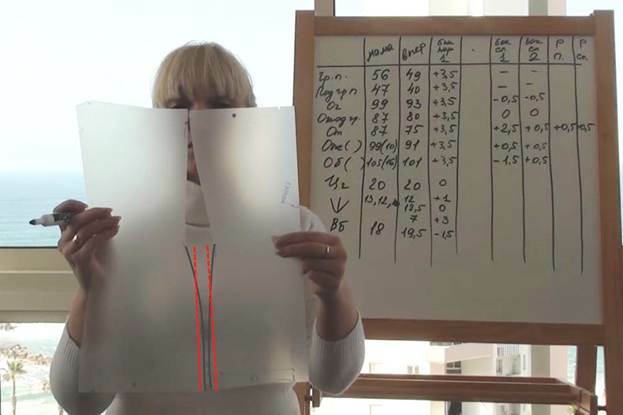 We need to analyze the way the side seam configuration changes in the area between the bust line and the waistline. Let us look at the pattern. 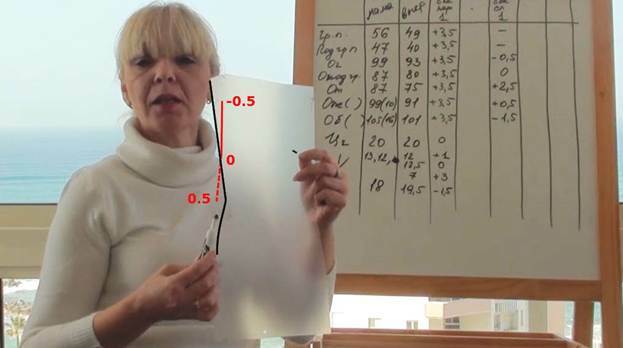 The value of adjustment along the bust line is -0.5cm whereas it is zero along the under-bust line. I connect these points. According to the calculations, I will need to make the pattern larger in the waist, so it makes sense to prolong the line. I move to the next column, "Back Sides Adjusted 2." I leave it at -0.5cm for the bust line and at 0 for the under-bust line and shift it 0.5cm outwards along the waistline. Let's see what I have got. I have expanded it by 0.5cm along the waistline but it should have been 2.5cm. This difference of 2cm can be distributed between the princess seams of the front and the back. Don't forget that the princess seams of the front are only involved in alterations at the waistline level and below. Let's calculate it. I divide 2cm between the four raw edges of the princess seams of the front and the back. As the result, I need to shift each of those edges 0.5cm outwards at the waistline level. We will use another two columns, "Princess Seam Back" and "Princess Seam Front" (7 and 8), and write 0.5cm under "Waistline Circumference." It is logical to assume that I may as well shift the adjusted side seam of the back 0.5cm outwards in the stomach and in the hips to achieve a smoother line. But according to the preliminary calculations of the side seam of the back, I need to remove 1.5cm in the hips and now I want to add another 0.5cm. It means I will need to use the princess seams to remove 2cm, i.e. shift each raw edge 0.5cm inwards. In other words, I shift the princess seams 0.5cm outwards along the waistline and 0.5cm inwards along the hip line. But it makes the princess seams perfectly straight, with no account for the shape of the buttocks. In other words, we will make a nice slim fit in the waistline and leave a plain straight line in the buttocks area. It doesn't feel right to me even though my mum's figure is close to this picture. Her buttocks are not so prominent but I still don't want to make those seams absolutely straight. Let’s try to look in a totally different direction. 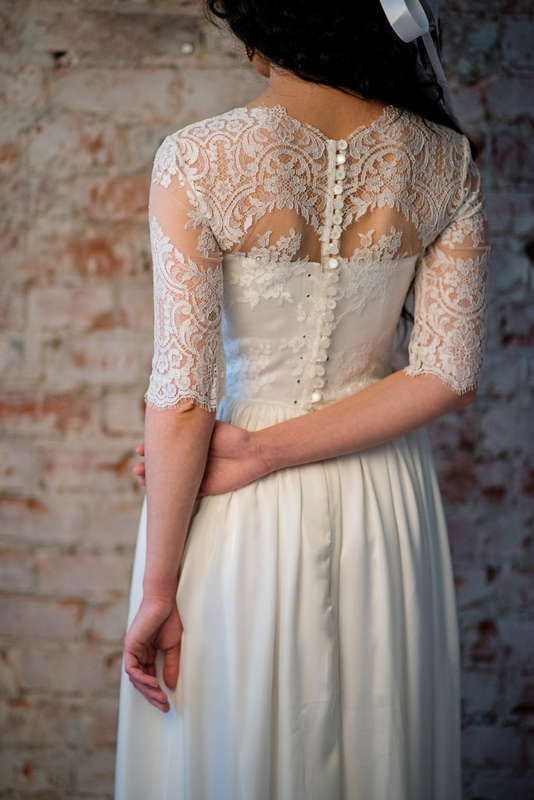 Could there be a good way of altering the side seam while preserving both the dart at the back and the curvature of the side seam, though maybe somewhat eased down? It would look a lot more logical. As a last resort, I could remove any extra centimeters in the side seams during a fitting. I return to the alterations of the side seam of the front. Let us fill in the column that we skipped: "Side Seam Front Adjusted 2" (4). I leave all calculations from the top to the waistline unchanged. But I will try to reduce the curvature of the side seam in the area between the waistline and the bottom edge. Instead of shifting it outwards by 3.5cm in the waist, I will shift it outwards by 4cm. In this case, there will be a gradual 0.5cm change from the under-bust line to the waistline (from 3.5cm to 4cm). The adjusted side seam of the front has the same kind of transition from the under-bust line to the waistline with a 0.5cm change (from 0 to 0.5cm). Therefore, the side seam has the same configuration at the back and at the front. In this case, however, I need to re-calculate the values for adjusting the princess seams. I have already shifted the side seam 4cm outwards from each side of the front half of the dress (a total of 8cm) and by 0.5cm from each side of the back half of the dress (a total of 1cm) at the level of the waistline. I distribute 3cm between the eight raw edges of the princess seams at the front and back of the dress. As the result, I need to shift each of them outwards by about 0.4cm. I write 0.4cm into the table. I leave the value for adjusting the side seam configuration of the front at 3.5cm in the stomach. It means there will be a gradual change from 4cm to 3.5cm between the waistline and the stomach line, i.e. the side seam will gradually go 0.5cm inwards. The adjusted side seam of the back should have the same configuration and the same incline. If you shift the side seam of the back 0.5cm outwards in the waist, then you should leave the adjustment value at zero in the stomach. I write 0 in the table. Let us re-calculate the adjustment values of the princess seams. I have already added 3.5cm from each side of the front half of the garment (a total of 7cm) and I am not supposed to change anything in the side seam of the back half of it. I distribute this 1cm between the eight raw edges of the princess seams of the front and the back. As the result, I need to shift each of them outwards by about 0.1cm. I write 0.1cm in the table. Let us move to the hip line. In order to preserve the contour of the side seam of the front and achieve a smooth transition from the stomach line to the hip line, I will shift it 3cm outwards in the hips. And I will shift the side seam of the back 0.5cm inwards at the same level to maintain the same configuration. Let us re-calculate the values for adjusting the princess seams. I have already added 3cm from each side of the front of the garment (a total of 6cm) and removed 0.5cm from each side of its back half (a total of 1cm). I distribute this 1cm between the four raw edges of the princess seams at the back of the dress. As the result, I need to shift each edge of each princess seam 0.1cm inwards. I write -0.1cm in the table. I mark that the side length has been reduced by 1.5cm in the columns for the adjusted side seams of the front and the back. Two centimeters added to the hip circumference is not so a crucial difference and there is really no need in accounting for it in the princess seams. If you prefer to have a slimmer fit in the hips though, you can shift each raw edge of each princess seam 1mm inwards. Our calculations seem to make sense. Clearly, the side seam is not going to have as pronounced curvature as the traditional corset silhouette but it is only natural for a garment sewn for a middle-aged woman. It's not like it will affect her figure in a negative way and at the same time she will feel comfortable in the garment. The garment will have a slim fit without "smothering" the wearer. I believe it's perfect in our particular case. We have calculated the adjustments for the base of the dress.